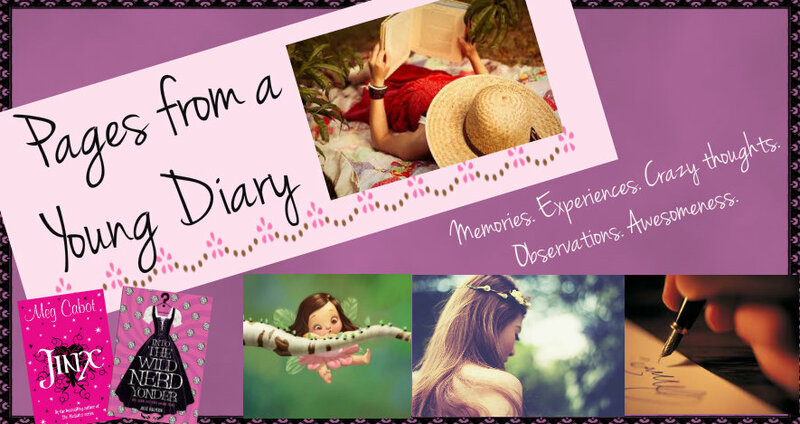 Pages from a Young Diary: The Nerdy Things I Can't Get Over..! The Nerdy Things I Can't Get Over..! How do you even define "nerdy"? I'm just going by what 'people' say or react like, even though I don't even notice much what people's opinions are (who has the time to consider them?)! Still, there are many things normal common people do or like that I don't do or like. Example, watching movies. I dunno, I would rather read. That's all. Spending hours in front of a screen just watching seems like a waste of time, unless what you're watching holds some meaning or gives you intense emotions you would like to think over, or something like that. Don't get me wrong, I do like certain movies. Just that they end up being based on books. It's almost magnetic, half of them were those I didn't even know were based on books. And I prefer English more, no offence to Bollywood. But anyway, how else do you explain that I can watch kids' movies (Charlie and the chocolate factory, Madeline, Matilda, 101 Dalmitians, etc) easily over and over again? That I would be hooked to a movie on TV and years later discover a book with the same title? (Tuck Everlasting! The scariest movie on immortality ever! I mean, it just made me scared of the idea of being immortal). I love animation films, although I wouldn't watch these all by will or deliberation, except sticking to my ritual of watching Christmas movies on Christmas. I must be very bored, or have the time for it to be able to watch a movie. When it comes to movies based on books that I've read these past 2-3 years, I feel differently. I admit to acting like a demented hypermaniac when the Harry Potter movies released. I had to watch them and get the movie DVDs on birthdays. I had to watch them countless times whenever I had time, but they were awesome movies, you've got to see! I don't feel the same for movies-based-on-books right now. It's weird, really. I used to be so excited about watching a movie replaying the same story I read, but in the past few weeks, watching trailers made me nervous. I wasn't so sure that the movies would stay true to the books. I suspect they'd give in to commercialization, which, I don't like. Books. Synonymous to "life" for me, however dramatic it may seem. But really, whatever sanity I have left in me is because of them. Just. Love. Them. All. :') I love collecting books, not just for the sake of collecting, but if I'm reading something I'm liking, I have to have it. I ask for books on birthdays, and whatever occasion demands a gift. My family finds it so weird that they've taken a list of books as a complimentary gift to the "main" gift for birthdays. Who's going to tell them I care more about the complimentary? Some friends say, 'we won't gift you books, you need something more normal', but they happen to be college-people, mostly, so it's okay. The other nerdy friends just know which book would be ideal. I appreciate both, though. 1. Randomly going through books I have. 3. Thinking of ways in which that huge carton that brought with it the new washing machine, could be folded and converted into yet another book holder. 6. Emailing the nerdy friend(s) about 'smart' things I got to know. Mostly stuff from books that made me think deeply. 7. Browsing through HBO, WB, Star Movies, World Movies, etc and stopping to watch a Narnia movie. - Collect quotes, mostly in a notebook dedicated to bookish-updates. - Make stuff like papier mache objects, cards and simple bookmarks. - The only kind of apps I use include: Angry Words, Notes, Duolingo, Kindle, Feedly, Blogger, Goodreads! - Use four different colored pens while taking down notes in class. And the colors should include pink and purple, or else it'll be too boring! - Add cuttings of Natasha Badhwar's column to the folder with other newspaper cuttings, including Sonal Kalra's column! - Make progress with some online course I'd be pursuing (this is a recent add-on). You get the gist. -_- Now who has the time to go shopping or gossiping when there is so much to do? Who wants to stay back in a wella college when I'd rather find peace doing all these things? Which lately includes being in denial and shock and crying over the end of the third book in the Vampire Academy series. I mean! It's going to be three days! I have no idea how to get over it! I've even started reading something else entirely, instead of moving on to the next book! hello Ashna. I'm a keen reader of your (and usama's) blog. Sorry I didn't give a single comment to your posts due to my fear that what would I say. I'm not well in writing and when it's about to say the person like you, I'm down. I've read all your posts, WHOLE, Complete. Even twice and Thrice. See, last time I tried to contact you but see, the problem with me... I couldn't do. PS: whatever it be...I'll keep in touch with your pages... you are awesome when you write. plz don't take big gaps. Some invisible people wait for your sayings. okay! It really feels good to know when someone can relate to what you're feeling! Pls feel free to write whatever you think, language is no barrier. It's just a medium of communication! I'd definitely try writing more frequently. Believe me, I miss it too. Just going through a time when I don't either get time or don't feel up to it (which is horrible, but I'm waiting to get free from some commitments right now :) ). Thanks again! :D Take care!!! Just how random could you be?